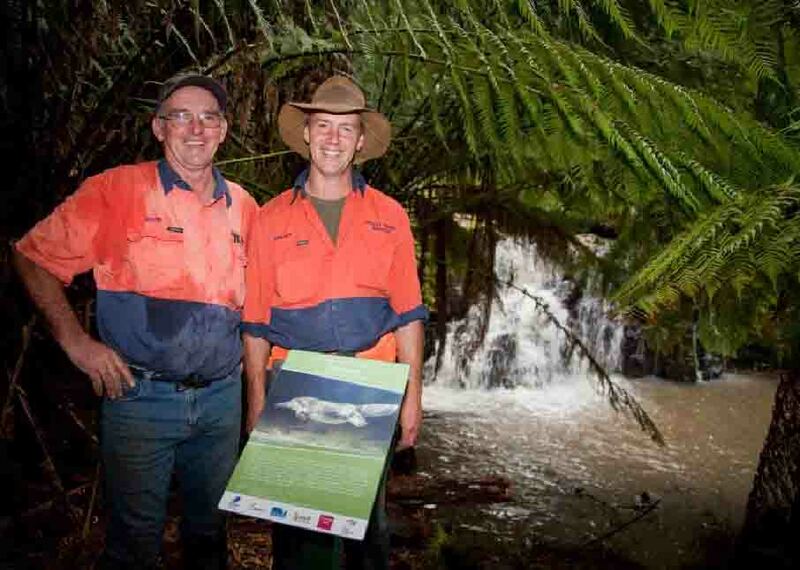 _ Have you tried out our new Binginwarri Landcare website yet? I might be a tad biased but I think it’s fabulous - try it and see, lots of useful information on there. Thanks to John McClumpha for all his hard work! Firstly, on behalf of the group, I’d like to wish Graham Roberts (an old Bingi Landcarer) all the very best for a speedy and complete recovery from his recent stroke, and we hope Kay manages to keep her chin up during this hard time. Our thoughts are with you both and the family. Our walk in May to the land-locked and little known Binginwarri State Forest was a very enjoyable day for the half dozen people who made the effort. After an enormous walk up a big, steep hill where we enjoyed great views of Corner Inlet, we were rewarded with the path flattening out a bit, and able to look around more at the vegetation. Cattle have been taken out of the forest that was replanted about 20 years ago and understorey is starting to reappear. Bracken, Daisy Bushes (Olearia,) Saw-sedges (Lepidosperma,) Dogwood (Cassinia,) Fireweed (Senecio,) and many more plants were making a comeback. We saw about 9 different species of fungi and photos of what we saw are now on our website. After a delightful amble we came to the rainforest area we’d wanted to explore but a wall of impenetrable blackberry stopped us at what Dallas calls Little 9 Mile Creek. We could get no further! It looked like a very inviting plant community on the other side of the blackberry hedge, especially for this far south on the Hedley Range. We shall obviously have to go back another time, perhaps armed with machetes! Or if anyone knows where the easement off Hedley Range Road is exactly, we’d love you to show us. Thanks go to Jude and Dallas for showing us their property, a little, and the forest they back onto, a lot. We enjoyed some scrumptious home made breads from Jude, over lunch and a cuppa. We look forward to seeing more & new faces at our next outing. Try us! A little girl walks up to her grandfather and says: "Grandpa, can you make a sound like a frog?" Grandpa says: "Honey, why do you want me to do that?" And the little girls says: "Well, Daddy said that when you croak, we all get to go to Disney World!" 1. If anyone would like to take part in a workshop on July 27 and 28th at Phillip Island, to become a trained volunteer to help rescue and treat oiled wildlife, please contact rfennell@penguins.org.au (not Bruce!) An agenda for the workshop and maps to the area are attached herewith. 2. Bruce has been advised that The Northern Pacific Sea-star has now reached Tidal River at Wilson’s Promontory. He requests that anybody using the coastal waterways of the area keep a strict eye on the problem and report any findings to DSE’s Customer Service Centre on 136 186. He has available a brochure showing pictures of this marine pest and telling what is being done about it. I suggest you contact him directly for a copy, as it is too large to send with our Babbler. Bruce’s contact details appear below. Now we come to news of the recent opening of the Strzelecki Track…. I think most people know that Hedley Range Services were one of the main contractors to establish the track and worked very hard to make it all happen in time for the grand opening. We congratulate Kevin and the Boys on their job very well done! It will no doubt bring many tourists to the area, which is great for our local economy. It’s also nice to have a track that probably rates as one of the world’s longest continuous walks - iconic - and certainly one with exceptional beauty. Have you tried any part of it yet? There are several shorter loop tracks… you don’t have to tackle the whole 110km!! For anyone who attended the opening, a bit of a quiz to see how much you remember! Answers are further on in the newsletter. F Confusingly, none of the public water supply in this reserve is in wells! H Life has been no picnic, but now people are looking up to me! I This centre has a Centre at its centre, but it's not the centre of the Universe! 3. WHO OR WHAT AM I? B I seem to have an identity crisis, but I’m not a hoax! C I’m rare, yet I’m abundant around Macks Creek. D I get my name from a fragrant foreign relative but I’m native to Tarra Bulga National Park. F Think the saying ‘giant oaks from little acorns grow’ sounds impressive? It’s nothing compared to my size extremes! G I’m a skinny survivor from a cooler, wetter climate...for now. H Unlike my cool namesake I’m a type of Strzelecki forest not found in Tarra Bulga, but someone is trying to save me from extinction, which makes me feel…warm! I. Koalas love me and my name relates to both where I live and my attractive shades. J I’m an endangered local who is rather crusty, but a protective parent. Fungi are the fun guys! Always popping up unexpectedly, often wearing bright party clothes, and falling in a heap a short time after the party is over! Fungi come in all shapes and sizes, types and colours – they really are a very diverse range of plants! A hand lens of at least 5X magnification is handy to find the smaller specimens. They are most common in moist gullies of tall forests - check under fallen trees and in their cavities, on branches and trunks and on the ground. Fungi also occur in deserts after rain and even on coastal sands. They also can be found in or on your house and in your backyard! Most people don’t realise that the fungi we see (the fruiting bodies) are just the tip of the iceberg, so to speak. Under the ground (or in the wood or where-ever the fungi grows) there is another world full of the ‘roots’ of the fruit bodies. These ‘roots’ are more accurately called hyphae – and a mass of hyphae is called a mycelium. Some of these masses can be hundreds of years old and cover a very large area. The old-fashioned name of toadstools, which we considered were ‘the poisonous ones’ or mushrooms that were the ‘edible ones’, is a fallacy. A name is just a name and has been used interchangeably. In fact there are many poisonous species of fungi so a general name will not prove its edibility. Best not to eat anything unless you are 100% sure of its identification. Always consult an expert or someone who regularly eats what they collect. Many European people have collected fungi for eons. If you fancy your hand at taking photos of them, and you want them to be identified, can I give you some tips please? Always pick one of the group and put it upside down beside the others so that it shows the underside. The fertile surface (the underside) helps greatly in identification. Either measure the cap, or put a biro, coin or matchbox in the shot for size comparison. Size does matter! Time of year, if not recorded by your camera. Location – be as accurate as you can (ie. 25m up the =track from Minnie Ha Ha Falls at Hiawatha) so the site can be re-located. Spore colour – this can be a great activity for children. Take a sample of a fresh fungi home and remove stem, place underside down on a sheet of white paper and leave overnight. Lift off cleanly and carefully in the morning and you should have a spore print – looking just like the underside of the fungi. If it is brown, the spores are brown, if red; spores are red and so on. Of course, if it were a white spore print, you’d have to collect a further fungi specimen and lay it on black paper to be successful! There are plenty of further notes you could take, but perhaps that’s enough to get you started. If you want to identify what you have seen or photographed, try the local library for any Field Guides to Fungi they might have, or ring me to arrange a loan of my books. A good one is Fungi Down Under; the Fungimap Guide to Aust. Fungi and another is A Field Guide to Aust Fungi by Bruce Fuhrer. Another good guide soon to be published is the JARR Project’s 3rd brochure in a series of 5. Two have been publishes already (Birds and Plants) and the Fungi one will be out soon. Keep an eye out! One last word on fungi…many are known to be toxic, so please wash your hands after handling the fruiting bodies of fungi. 1A. Merriman’s Creek; B. Mt. Tassie; C. Jumbuk; D. Tarra Valley; E. Diaper Track; F. Morwell National Park; G. Echidna; H. Koala; I. Balook; J. Wild Cherry Track. 2A. Butlers Track; B. Duffs Trail; C. Taylors Road; D. Billy’s Creek Weir; E. Macks Creek Hall; F. Cool Temperate Rainforest; G. Slender Tree–fern; H. Waterfalls; I. Mountain Ash; J. Mount Tassie Lookout. 3A. Lyrebird; B; Platypus; C. Sticky Wattle; D. Balm Mint-bush; E. Myrtle Beech; F. Mountain Ash; G. Slender Tree-fern; H. Warm Temperate Rainforest; I. Mountain Grey-gum; J. Gippsland Spiny Cray. Our Events Calendar has been updated for the remainder of the year. Click here to view calendar. There are still some Binginwarri Landcare gate signs available, so if you are a paid up member and desire one, please ring John or email John. Want to unsubscribe from the newsletter? Send an email or ring the editor and it will be done. And that, as they say, is another edition wrapped! Hope you’ve enjoyed what we’ve presented, this time around.